This is my gift to the people. It feels like the pinnacle of my contribution to veganism. 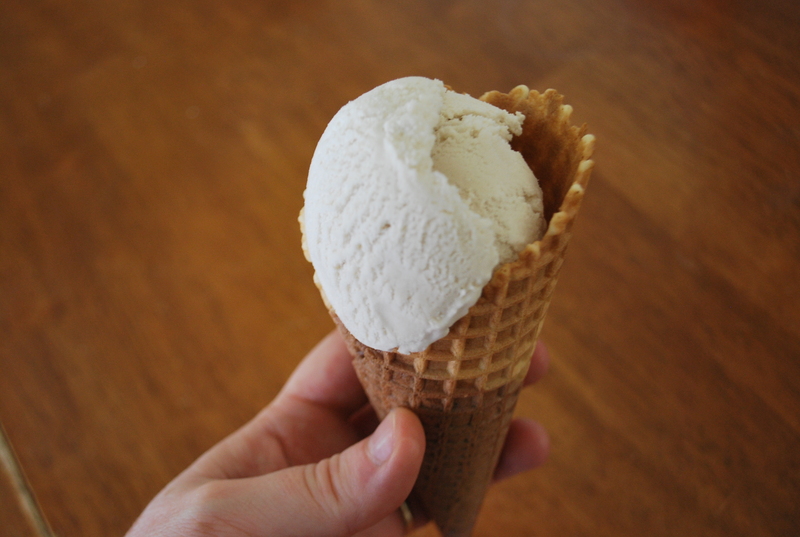 I take full credit for the modification of other vegan ice cream recipes into an incredibly simple, quick, cheap recipe – with no fancy ingredients – that scoops directly from the freezer with the perfect softness. 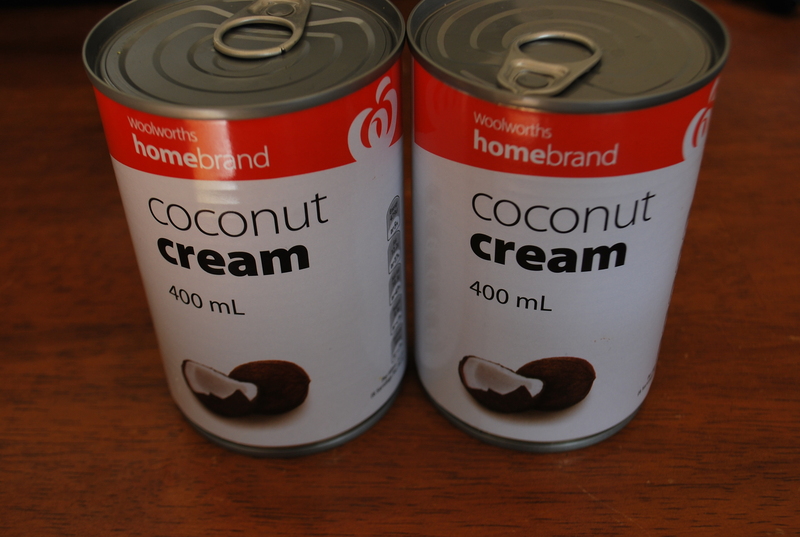 Right now I only recommend this one particular brand of coconut cream, but it’s the ubiquitous Woolworths Homebrand Coconut Cream found in Countdown supermarkets for $1.20 per tin. Ensure your ice cream maker bowl has been frozen for at least 24 hours. Put all ingredients into a pan and stir over a low head until sugar has dissolved – no need to boil. Place mixture in freezer or fridge until very cold. Once cold assemble ice cream maker and pour mixture into bowl. Churn until very thick. Return churned ice cream to freezer and freeze. You should be able to eat this as ice cream after it’s been frozen for around 1 and a half hours. This is absolutely as delicious as the fancy brands that are around $8 for 400mLs. This is the vanilla recipe and it operates as a base, flavour this any way you damn well please. NOTE: If you are a rebel and a troublemaker with no regard for potential waste you can trial other cheaper brands of coconut cream. You’re a braver kind than me. Let me know how you go. One of the most important thing to avoid is the formation of oil on top of your mixture. If oil forms it will destroy your batch. Watch out for that with other brands. If oil forms, remove as much as you can. You may also use coconut sugar and agave to make it low GI. Experiment with Stevia and Erythritol; the world is yours. I have a recipe up already, but this one is better. Topped with chocolate butter-cream frosting. This is not “low in sugar, low in fat”. This is Just Good Cake. Mash bananas, add all dry ingredients, all wet ingredients (except apple-cider vinegar), and mix. Add apple-cider vinegar. Mix. Bake long and slow. Bring out of the oven when springy to touch and golden. In your food processor whip up margarine, icing sugar, cocoa and vanilla. I don’t have the ratios, it’s just a heap of margarine and taste as you go. It should be light and fluffy. 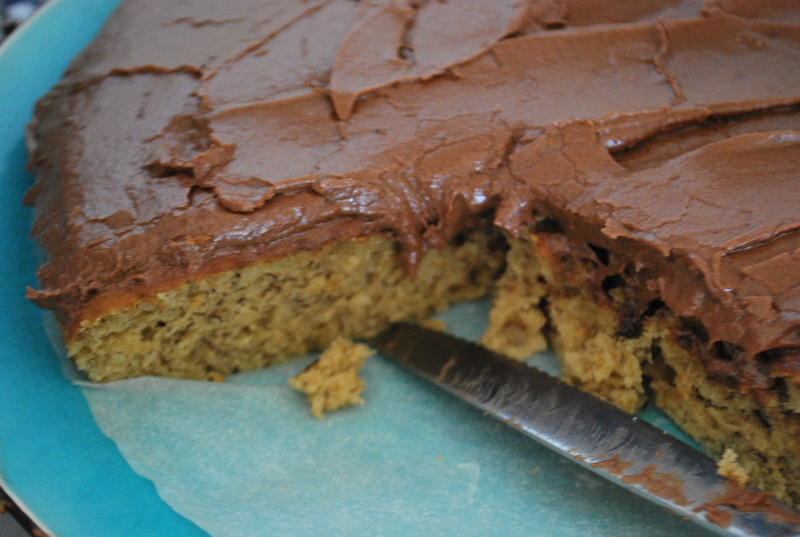 Use a spatula to apply to the cool cake. If you make too much frosting just freeze the leftover, it’ll last. This is probably a rather healthy desert – I mean, it’s pretty much muesli disguised as pudding! (Although, probably anything could disguise itself as pudding if it sprinkled a bit of sugar on itself). With lots of fruit, seeds, and oats, it does provide a chunk of nutrition. And sugar… for energy? 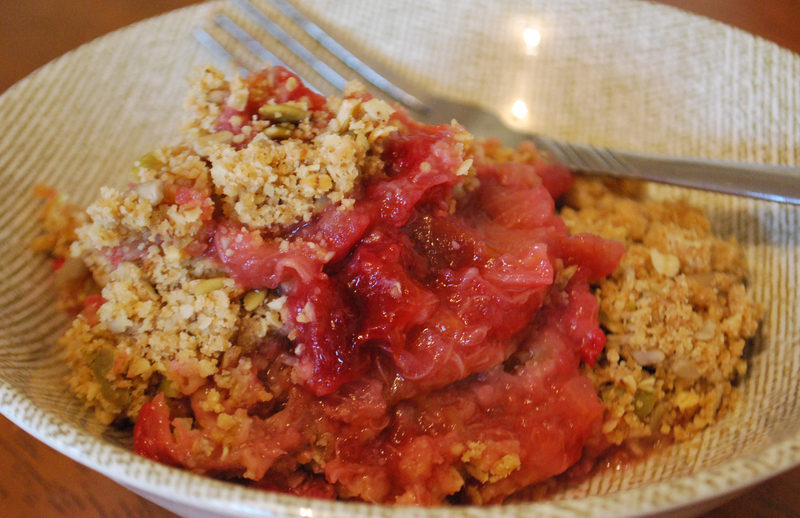 The trick with crumbles is to use lots of apple – they’re nice and sweet, cheap, and bulky, so provide a good base to fill out the crumble – and use smaller/more expensive tasty fruits for the flavour. Peel the apples, then slice them up as well as the rhubarb and plums. Chuck them in a pot, sprinkle with the sugar and cover with some water. Bring to the boil, and let it do so until the rhubarb is nice and soft. While you’re waiting for the fruit, in a food processor (or with your fingers) blend together the flour and marg to form crumbs. Then blend in the oats, brown sugar, seeds, and cinnamon. Drain the fruit, layer onto a dish, then sprinkle the crumbs on top. Bake at 200ºC until it starts to brown on top. *Authors note: If the blog wasn’t “low in sugar, low in fat”, I would probably also grate some chocolate onto the fruit before putting the crumbs on, and mix in some maple syrup. This delicious slice is no-bake. It’s not low sugar, but thankfully we have a new raw editor, Nikki, and her contribution will cancel this out. Don’t be put off by the 3-part recipe. It’s quick-quick-quick to make. Blend biscuits in food processor. Add other base ingredients. Blend into a dough. Press dough into a baking tin (no need to grease). Refrigerate while you prepare the fondue. Quickly clean your food processor. Melt your coconut oil. Add all fondue ingredients to the food processor, including melted coconut oil. Using processor, blend into a paste. Use a spatula to apply this layer to your base, then refrigerate while you prepare the chocolate. Melt chocolate and coconut oil together (I melt mine in a bowl, over hot water, do not get any water in the mixture). When ready, pour this over the other two layers, and tip your pan to gain even distribution. Chill for 20 minutes or until chocolate is firm. Cut into squares before it is totally solid. This tastes best once it’s been refrigerated overnight to gain full firmness. You’ll need to keep it refrigerated before serving, especially in Summer.